Notes: 1999 Tim Hills: Heavily leaning, it may at some time in the future need to be propped. Hollow with a large internal stem. An outpouring of growth where the hollow closes over. 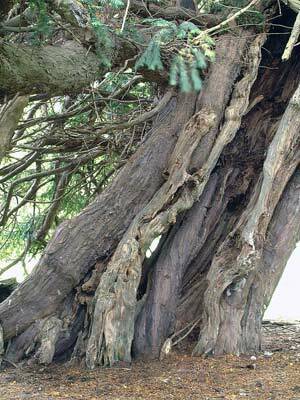 Latest information: 2015 Paul Wood: The stooping branches of this fine yew challenged us but we were able to record a measurement of 21' 8'' ( 6.60 m) at the ground. It was no longer possible to photograph as recorded in 1999 and 2004; only in one place had the tree been trimmed back sufficiently (to stop stock in the next door field from coming into contact) for a close up of the bole.